Preacher - Pilot - Review: "It Begins"
The wait for this show has been a long one, and I'm really glad that it didn't disappoint. I'm not the biggest fan of Seth Rogen's movies (although I did enjoy This is the End) so I was kind of sceptical to hear that he'd play a part in creating a Preacher adaption. I know enough about the source material as a comics fan to sort of know what to expect even if I haven't read it, and even though that it hails from the same DC Imprint that iZombie did, Vertigo Comics, it's pretty clear that both shows are at completely different ends of the comic book spectrum, with Preacher feeling closer in tone to FX's Justified than it does any normal comic book show, although at the same time it really is its own thing. 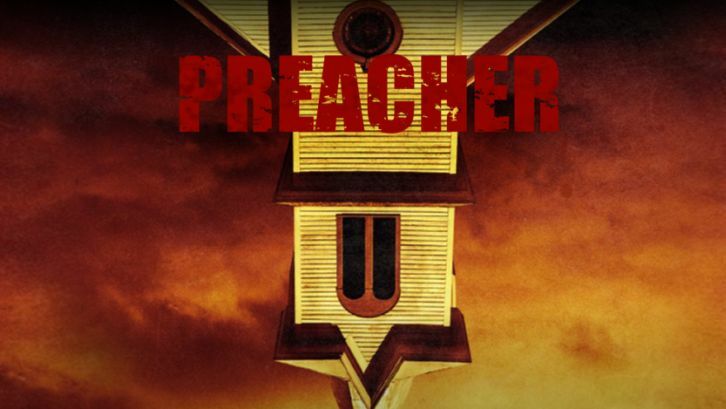 Preacher itself focuses on the protagonist, Dominic Cooper's Jesse Custer. Cooper handles the character incredibly well and it's nice to see him having moved onto something this quickly after Agent Carter's unfortunate cancellation, Cooper's role as Howard Stark was one of the best parts about the series and his performance as the titular Preacher really works well here as we quickly know what we're going to be getting into as soon as the show hits the ground running, promising blood, violence and gore. It's perfect then that this show is at home on the same network as The Walking Dead, as AMC are really looking for another breakout hit because no matter how great they are, Halt and Catch Fire & Hell on Wheels haven't exactly set the ratings world alight. Then again, neither has Preacher yet, launching on a packed night with plenty of competition from more established shows. The pilot, over an hour long, opens strongly with a scene that was posted online prior to its release, focusing on an African Church including characters that we're not likely to see again. Here we meet a Preacher talking about the coming great war, until he falls victim to a mysterious light from the heavens that has travelled from outer-space through Saturn, completing its course to Earth. It's the closest part of the hour that we'll get to a superhero show but this is not the arrival of Kal-El from Krypton, but instead, something capable of possessing the preacher who now proclaims that he is the Chosen One. This lasts for a matter of seconds and results in his explosion, which causes panicked churchgoers to flee, and the Church's cross to turn upside down. After this intro we meet Jesse Custer, who is a Texas Preacher. Jesse is preaching to people who won't listen, with kids occupied by their tablets. Until one boy asks Jesse to hurt his father for him, having heard rumours about what he did before he became a Preacher. However Jesse counters, and is reluctant to accept. Over the course of the episode we're quickly introduced to Jesse as he goes about his tasks, approaching the abusive stepdad only to learn that his wife likes the pain. But before his normality can continue he's reunited with Ruth Negga's Tulip, who we just met after she bit a man's ear off and used a bazooka to take out a helicopter. This is a fantastic introduction to the character that steals pretty much every scene she's in so far, and it's great that it looks like we're going to see more of her in the future, because she's come to Texas with a new job for Jesse. We learn that this new job involves a map and how it isn't just going to be a simple mission, but Jesse's reluctant to accept this, saying that he's started a new life and is no longer what he once was. He and Tulip both apologise for past events, and it's clear that these characters have a history that we're only going to find out later. And meanwhile, in the background, we are slowly introduced to Joe Gigun's Cassidy, who is a Irish Vampire. Yet he seems immune to the spraying of holy water and manages to escape out of a plane, using a parachute to land in Texas. We'll be seeing more of him later, but for now, so far, Cassidy, Jesse and Tulip are shaping up to be fantastic characters that will be interesting to follow going forward. The African Preacher meanwhile isn't the only believer who's dying around the world though, as it looks like others, including Tom Cruise, are taken care of. The unexpected randomness of killing off a celebrity in a cameo like this worked really well, and fit the tone of Preacher's absurdity just fine. However Jesse has new problems to deal with, including the dad of the boy who spoke to him earlier, and he's brought friends. Jesse breaks the man's arm, much to the shock of another occupant in the bar, Cassidy, who asks Jesse what kind of Preacher he is. Jesse ends up going home to ask God for an answer, but seemingly, none is given. At least, at first, until a mysterious presence enters him. This mysterious presence is enough to keep Jesse asleep for three days, and he awakes to find out that Cassidy has moved into the Church attic. He's also to dream about his father who tells him that he has to be a good guy, because there's "way to many of the bad". And then he watches him gunned down, right in front of Jesse's eyes. So it looks like Jesse has found a new purpose, and is able to preach words of advice to anyone who'll listen, including a man who ends up killing himself by cutting out his own heart. And it appears that this is the first clue that there are more mysterious signs at work here that we aren't quite fully aware of yet, because if there's one thing about AMC shows is that they like to take more of a slow-burn approach to things. Not that there's anything wrong with Preacher's pilot of course, because so far, it's pretty great. And things are about to get even more interesting with the group of men who are apparently following whatever this thing is that's possessed Jesse, but we'll have to wait until June 5 to find out what happens next. The wait is a real shame of course, because it means that there's not going to be an episode of Preacher this Sunday, but the Pilot has given us a great idea of what to expect from this weird but pretty fun show. There's enough to give us a vague idea about this world, and I wonder whether we'll see any more unexpected celebrity deaths like Tom Cruise, which was totally random. But then again, in a show like Preacher, where we've also met several fascinating characters already, I guess this is only to be expected. What did you think of Preacher's Pilot? Let me know in the comments section below. +Dominic Cooper as Jesse Custer. +Effective introduction to the characters and the world. +The humour works really well. Milo is an Arsenal FC supporter and loves TV shows like Battlestar Galactica, Justified, The 100, The Americans and Person of Interest. He reviews Black Sails, Hell on Wheels, Murder in the First, Narcos, Preacher, The Shannara Chronicles and Veep for Spoiler TV as well as books, films and games for his own blog The Fictional Hangout and contributes to comic reviews on a weekly basis for All-Comic.